Bees and Butterflies will Thank You! When late summer rolls around, most gardens are getting a little tired, the big floral summer show taking it's final bow. 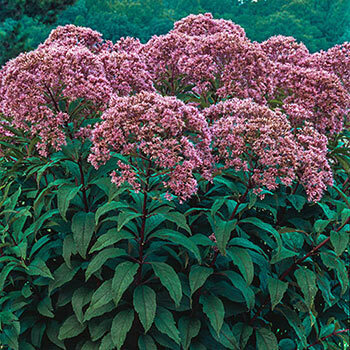 Gateway Joe-Pye Weed provides an important service at this time of year—nourishing beneficial pollinators who are out looking for late summer flowers. It is a magnet for bees and butterflies. It's native, too, so you can expect quick growth and an easy time when you grow this. Gateway is stunning, too. 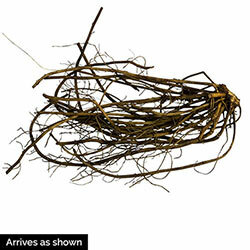 The wispy, fluffy flowerheads are accented by red-purple stems—you'll love this in a cut or dried arrangement. The foliage also makes a nice backdrop for your perennial beds—especially as it's more compact than others in the species, growing to around 5-6' tall. Bloom Time Beginning in mid summer to early fall. Bloom Time: Beginning in mid summer to early fall. Flower Form: Dome-shaped clusters of tiny blooms 4-6" across. Soil Requirements: Well drained moist soil.